Heard of Botox? I thought as much! So why would I bring it up now to my educated patients and readers? Because the anti-aging world often tells us to focus on newer, better, cutting edge, state-of-the-art, yet we practitioners who see results all day every day know that just because something isn’t new doesn’t mean it’s not the gold standard. Botox can do all THAT?? Botox’s remarkable versatility allows us to relax deep persistent lines and wrinkles, smooth between brows, minimize crows feet and “bunny lines” on the nose, lift the corners of the mouth, even smooth vertical bands on the neck. All that and its molecular weight allows for tremendous precision. 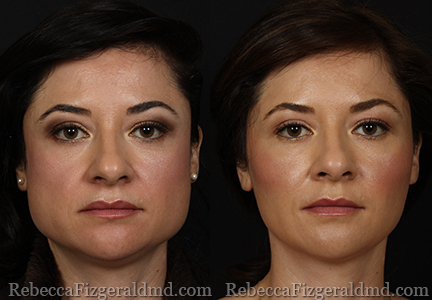 One particularly embraced treatment is the reduction of enlarged masseter muscles. Women who are under a lot of stress tend to express stress not by yelling and screaming (though that might help! ), but by clenching their jaw or even grinding their teeth while they sleep. All the internalized stress placed on the jaw muscles is a workout! So they get bigger – just as if you were strength training in a gym. I love the story of how Botox was discovered for cosmetic purposes. An eye doctor in Vancouver came home one day and told her dermatologist husband about a patient who came in after being successfully treated with Botox for eye tremors that she wanted more of ‘that stuff’ because she looked so much better! Botox Cosmetic was and is a game-changer.